Francesca Schiavone is in the final of the 2011 French Open at Roland Garros after beating home hopeful Marion Bartoli 6-3 6-3 to defend the title she won here last year when beating Samantha Stosur in the final. Schiavone showed a great level of variety to her game as she coped much better with the windy conditions as the Bartoli crucially lost her service game when 4-3 down to the Italian who then served out the first set to the disappointment of the vast majority of fans watching the match. Bartoli started the second set strongest though, breaking Schiavone at the first chance to take a 2-0 lead. However, the Frenchwoman couldn’t build on it and Schiavone broke back instantly and showed the vast array of ground strokes and the ability to create angles from all over the court that helped her win the same title last year as she broke Bartoli again to close out the match and end the home hopes of a French winner. Schiavone’s opponent in the final will be Li Na who overcame Maria Sharapova in straight sets, 6-4 7-5 in the first of the two semi finals. For Li it is her second straight appearance in a grand slam final after reaching the Australian Open final earlier in the year before losing to Kim Clijsters. The Chinese player took advantage of 5 double faults and 16 unforced errors from Sharapova to take the first set, but like Schiavone, she suffered an early break in the second set as Sharapova looked for a way back into the match. However, Li continued to move Sharapova around on the clay surface on which she has struggled before and her problems with her serve in the conditions ultimately ended the game as she finished the match with her 10th double fault to seal Li’s passage into the final. 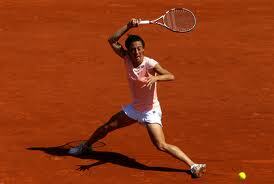 Schiavone and Li will meet on Saturday to decide the second grand slam winner of 2011. Meanwhile in the men’s draw, the semi finals will take place tomorrow with the top 4 seeds battling it out for a place in the final. Five time champion and World number 1 Rafael Nadal takes on the Australian Open runner up Andy Murray with Nadal a big favourite to advance for the chance of a 6th title whilst the on fire Novak Djokovic takes on Roger Federer. The Swiss player who has fallen behind both Nadal and Djokovic will be keen to show he is still a force in all the grand slams whilst Djokovic is still unbeaten in 2011, setting all sorts of records on the way as well as winning the Australian Open title. Both semis promise to be extremely exciting with the two winners meeting in the final on Sunday.